At present, EUS-guided biliary drainage (EUS-BD) and EUS-guided pancreatic duct drainage (EUS-PD) are performed as salvage therapies in failed cases of ERCP.,,,,,,,,, Although the technical success rate of ERCP is reportedly high (>90%), the procedure may become challenging because it involves nonestablished transmural procedures with few dedicated devices. These transmural procedures may cause serious adverse events (e.g., perforation, bile or pancreatic juice leakage, stent migration) aside from those caused by transpapillary procedures on ERCP. One of the most difficult procedures during EUS-BD, particularly EUS-guided hepaticogastrostomy (EUS-HGS) and EUS-PD, is tract dilation. A conventional mechanical dilator (MD) or a 4 mm diameter ultra-slim dilating balloon for transpapillary dilation used to be applied for tract dilation during EUS-guided interventions.,,,,,,,,, However, tract dilation is not always successful because the Gastrointestinal tract wall, parenchyma of the liver/pancreas, bile duct, and PD are very hard to penetrate using these devices.,, Recently, cautery dilation using a 6 Fr cautery dilator (CD) or a needle knife has been used for tract dilation. However, tract dilation using a needle knife is a well-known risk factor for bleeding. Furthermore, a 6Fr CD is usually not available in the USA or South Korea, and it may have a risk of acute or late bleeding owing to its thermal effect. Thus, we developed a new ultra-tapered MD designed for EUS-guided transluminal drainage. Herein, we retrospectively evaluated the safety and usefulness of this novel ultra-tapered MD compared with a CD in EUS-HGS and EUS-PD cases. This retrospective comparative study between the electrocautery (cautery) dilator group and the MD group included 64 patients in whom ERCP failed, and EUS-HGS or EUS-PD was performed between April 2015 and April 2017 at two centers (i.e., Tokyo Medical University Hospital and Keio University Hospital). We divided the study into two periods. The first 33 consecutive patients treated between April 2015 and March 2016 consisted of 20 men and 13 women (mean age = 67.6 years) who underwent tract dilation using a CD. The next 31 patients who underwent EUS-guided drainage using the new MD between April 2016 and April 2017 consisted of 15 men and 16 women [mean age = 70.2 years; [Table 1]. The reason for the sequential use of the two methods for tract dilation was that we have used the new MD since April 2016. The indications for EUS-HGS at our institution were previously described as follows: (1) biliary cannulation is not possible; (2) the papilla is inaccessible owing to a surgically altered anatomy or gastric outlet obstruction; (3) percutaneous transhepatic biliary drainage is contraindicated (e.g., in case of a large amount of ascites and self-removal of the drain due to severe dementia). The indications for EUS-PD at our institution were also previously described as follows: (1) the PD is dilated owing to a PD stricture or disruption causing ductal hypertension and recurrent pancreatitis; (2) the major/minor papilla or pancreaticoenterostomotic site is inaccessible by ERCP. The new ultra-tapered MD whose tip is extremely tapered up to 2.5Fr and is designed for a 0.025 inch guidewire, has a length of 180 cm (ES dilator DC7R180S; Zeon Medical Co., Ltd., Tokyo, Japan). To preserve its pushablility, a plastic material with high rigidity is applied. The tip of this catheter is very fine and lubricated for easy penetration of the needle tract. A radiopaque ring is implanted 1 cm from the tip and provides sufficient visibility under fluoroscopy [Figure 1]. Skilled endosonographers performed EUS-HGS (T. I., T. T., and R. T.) and EUS-PD (T. I. and T. T.) with the patients under conscious sedation by intravenous medication. All patients were given intravenous antibiotics prophylactically. Our standard EUS intervention procedure is as follows. A therapeutic curved linear array echoendoscope is positioned in the stomach with carbon dioxide insufflation. Standard 19G fine needles are used to puncture the dilated left intrahepatic bile duct or the PD. If the target is not sufficiently dilated or if the parenchyma of the pancreas is fibrotic, a 22G needle is used. After contrast medium injection, an insulated guidewire (0.025 inch VisiGlide2 for 19G needle; Olympus Medical Systems, Tokyo, Japan, or 0.021 inch Metro for 22G needle; Cook Medical, Bloomington) or a noninsulated guidewire (0.018 inch PathFinder for 22G needle; Boston Scientific, Marlborough, MA) is advanced antegradely. Dilation of the needle tract is initially performed with a diathermic sheath (6Fr Cyst-Gastro set; Endoflex, Voerde, Germany) or an ultra-tapered MD. If needed, additional dilation can be attempted with a 4-mm diameter dilating balloon (Hurricane; Boston Scientific or REN; Kaneka Medix Corp., Osaka, Japan). Finally, the dedicated plastic stent or PCSEMS is transmurally placed [Figure 2], [Video 1]. The primary endpoint of this study was the technical success of the initial tract dilation. The secondary endpoint was the adverse events between the CD and the MD. Successful tract dilation was defined as the insertion of the maximum diameter portion of the first dilator into the bile duct or PD over the guidewire. In case of failed tract dilation using the first dilator, any other dilating devices including a conventional dilator catheter or a dilating balloon were used for stent placement. Thereafter, the overall success rate of stent placement was evaluated in both groups. Adverse events possibly related to the procedure in 1 month were described in accordance with the American Society for GI Endoscopy lexicon. The distributions of continuous variables pertaining to the baseline characteristics of the 2 treatment groups in the cohorts were compared using the Student's t-test, Welch's t-test, or the Wilcoxon rank-sum test, as appropriate. The proportions of categorical variables were compared using the Chi-squared test or Fisher's exact test. All reported P values are two-sided, and P < 0.05 were considered to indicate a statistically significant difference. Analyses were performed using SPSS (version 20; SPSS, Chicago, IL, USA). The study protocol was approved by our Institutional Review Board (Approval No. 3734). In the present study, 64 patients (mean age = 68.9 ± 13.8 years, 35 men) underwent EUS-HGS (49 patients) and EUS-PD (15 patients). The characteristics of all the patients are summarized in [Table 1]. The indications for EUS-HGS included malignant biliary strictures (n = 38), biliary stricture of the inaccessible anastomotic site (n = 7), and choledocholithiasis with altered surgical anatomy (n = 4). The indications for EUS-PD included anastomotic stricture (n = 11), chronic pancreatitis (n = 3), and malignant PD stricture (n = 1). Thirty-three patients were included in the CD group and 31 in the ultra-tapered MD group. Initial tract dilation was achieved in 95.3% of the patients (61/64) [Table 2]. There was no significant difference in the success rate of tract dilation between the CD group (97.0%, 32/33) and the MD group (93.5%, 29/31). A 19G fine-needle was used for 78.8% (26/33) of the patients in the CD group and for 74.2% (23/31) of the patients in the MD group (P = 0.66). Two patients (CD/MD: 1/1) were required to undergo additional dilation with a bougie catheter and 6 (4/2) with a dilating balloon (P = 0.54). There was no significant difference in the overall success rate of stent placement regardless of the type of stent used between the CD group (97%, 32/33) and the MD group (96.8%, 30/31) (P = 0.5) as well as the procedure time (21.0 ± 12.6 min and 22.5 ± 6.9 min, respectively) (P = 0.13). Although the procedure time in the CD group was shorter than that in the MD group, the difference was not significant (17.5 ± 5 min and 21.5 ± 6.5 min, P = 0.09) [Table 3]. In cases of EUS-HGS, 34 (69.4%) patients (CD/MD: 16/18) were punctured at the bile duct of segment 3 of the liver (B3 branch duct) (P = 0.78). There was no significant difference in terms of the stent selection (PCSEMS/PS, CD vs. MD, 3/18 vs. 2/24, respectively, P = 0.8). There was no significant difference in the success rate of tract dilation between the CD group (100%, 23/23) and the MD group (92.3%, 24/26) (P = 0.52). The overall success rate of stent placement was 100% in both groups. The procedure time was not significantly different between the CD group and the MD group (28.4 ± 19.6 min and 27.2 ± 7.7, respectively) (P = 0.58) [Table 4]. In cases of EUS-PD, 12 (80%) patients (CD/MD: 8/4) were punctured at the body of the pancreas (P = 0.90). A fully covered self-expanding metal stent was used only in 1 case in the CD group. There was no significant difference in the success rate of tract dilation between the CD group (90%, 9/10) and the MD group (100%, 5/5) (P = 0.71). The overall success rates of stent placement in the CD group and MD group were 90% (9/10) and 80% (4/5), respectively. Adverse events were observed in 14 (21.9%) patients, namely, abdominal pain in 8 patients and bleeding in 6 patients at the puncture site [Table 2]. All patients with abdominal pain were improved conservatively within a couple of days after the procedures. All bleedings occurred in the CD groups (P = 0.04). One patient required blood transfusion after EUS-HGS, and 1 patient with severe bleeding after EUS-PD required transarterial embolization [Table 4]. All postprocedural bleedings occurred only in the plastic stent group [Table 2] and [Table 4]. 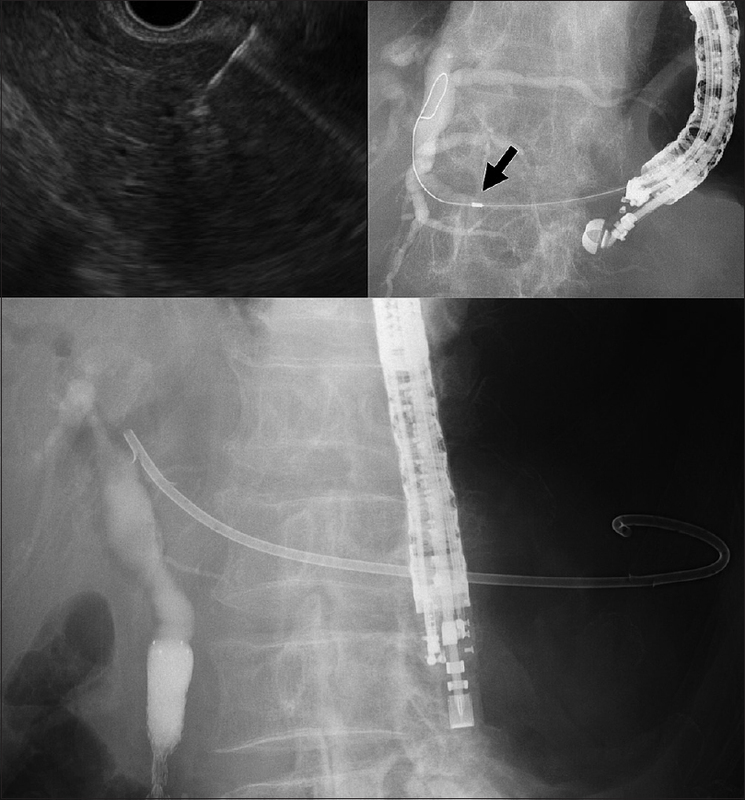 EUS-guided drainage is a preferable alternative drainage technique to conventional salvage therapies (e.g., percutaneous transhepatic drainage) and even surgical drainage in failed ERCP if the operator has advanced endoscopy expertise. There are several important steps to accomplish in EUS-BD and EUS-PD. These include puncturing, guidewire manipulation, tract dilation, and stent placement. Of these steps, tract dilation can be one of the obstacles, so-called Achilles heel, particularly in EUS-HGS and EUS-PD because the fibrous bile duct, PD, liver, and pancreas occasionally hinder the advancement of dilation devices. Several devices are currently available for tract dilation. These are mainly divided into two types: Nonelectro CD and electrocautery dilator. A nonelectro CD is subclassified into two types: MD for bougie and dilating balloon. An MD has been conventionally used and is very effective during conventional ERCP procedures. In terms of the dilating balloon, it has also been used for a tough stricture to achieve large bore dilation. However, aside from the transpapillary dilation of the short strictures of the BD or PD, EUS-guided tract dilation using current nonelectrocautery dilators appears to be difficult for several reasons: (1) longer tract (mostly in cases of EUS-HGS); (2) insufficient penetration ability to dilate a tough tract (GI tract-liver parenchyma-bile duct or GI tract-pancreas parenchyma-PD) due to the unsharpened tip and the presence of a step between the guidewire and the dilator tip, in particular when using a short-wire system which means a noncoaxial dilator; (3) unstable (flappy) echoendoscope position in the large stomach. Thus, several EUS experts prefer using an electro CD to perform fast and reliable tract dilation. An electro CD is subclassified into two types: coaxial dilator and noncoaxial electrocautery dilator. A small caliber, coaxial 6Fr electro CD (Cysto-Gastroset) which is not available in the USA and Korea, has high penetration ability with minimum traumatic damage aside from a 10Fr electro CD (Cyst-tome) which is available in the USA but can cause serious adverse events. In fact, one comparative study revealed that EUS-guided transluminal drainage of pancreatic fluid collections in the electrocautery group showed a significantly shorter procedure time than that in the nonelectrocautery group, although there was no significant difference in the technical success rates between both groups. In contrast, several endosonographers who cannot use a coaxial 6Fr electro CD have used a conventional needle knife as a noncoaxial electrocautery dilator. However, it was reported that the use of a needle knife for fistula dilation was statistically significantly associated with postprocedure adverse events compared with graded dilation using non-CDs on EUS-BD. Khashab et al. also reported that noncoaxial electrocautery (using a needle knife) was independently associated with adverse events and mentioned that the use of coaxial electrocautery for tract dilation is safe and that noncoaxial electrocautery should be avoided. Thus, it should be noted that a cautery dilation method can cause possible acute and late “burn effect” to the liver or pancreas parenchyma and vessels around the needle tract/GI tract, causing unexpected bleeding or inflammation (e.g., pancreatitis). Therefore, a dedicated MD with a sharpened tip (nonstep) and a stiff shaft has been sought for safe and secure tract dilation during interventional EUS. The 7Fr ES dilator is a new MD developed for interventional EUS to facilitate tract dilation. It has two types (i.e., DC7R180S and DC7F180S, Zeon Medical Co., Ltd.) according to the diameter of the guidewire used, namely, 0.025 inch and 0.035 inch, respectively, although only a 0.025 inch type dilator was used in this study. There are two big advantages compared with traditional MDs, dilating balloons, and CDs. First, it has an excellent performance of penetrating the needle tract due to its stiff shaft and 2.5 Fr ultra-tapered tip without step between a 0.025 inch guidewire and a dilator. Second, tract dilation is achieved without the “burn effect” to avoid unexpected adverse events. Surprisingly, even when a 0.018 inch stiff guidewire for a 22G needle was used, tract dilation using this new dilator was successfully performed. In the present study, we retrospectively evaluated the safety and efficacy of our newly developed ultra-tapered MD compared with the commonly used 6Fr coaxial CD. There was no significant difference between the two devices in terms of the technical success rate and the number of patients who needed additional dilation of the needle tract to accomplish stent placement. These data suggest that the efficacy of an ultra-tapered MD is similar to that of a coaxial CD. Furthermore, procedure-related bleeding was not observed in any cases in the MD group, whereas it was observed in 6 (18%) cases in the CD group (P = 0.04). These results show that the new MD allows safe tract dilation without the “burn effect” regardless of the procedure types. Thus, this newly designed ultra-tapered MD may be more suitable for interventional EUS, particularly in patients with a bleeding tendency and the presence of inevitable intervening blood vessels in the puncture line. Theoretically, large bore self-expandable covered metal stents can prevent bleeding caused by tract dilation because of hemostasis by tamponade. In fact, in the present study, the bleeding cases were observed in the plastic stent group. From the aspect of postprocedure-related bleeding due to tract dilation, a large bore self-expandable covered metal stent appears to be ideal not only for better drainage but also for hemostasis of unexpected bleeding. However, dedicated metal stents with anti-migration properties for EUS-HGS and EUS-PD are presently not commercially available in all countries except in Korea., A conventional tubular metal stent may cause migration which is the most miserable adverse event because it requires emergent operation or it may lead to a fatal condition. Furthermore, a large bore metal stent may be traumatic owing to the overdilation of a small duct. Thus, we frequently used a 7Fr or 8Fr dedicated single pigtail plastic stent with four anti-migration flaps to avoid migration. In the present study, a partially covered metal stent was used only in 6 (9.4%) cases because most cases showed nonmarked dilation of the BD and PD. Nevertheless, since plastic stent placement may cause bleeding from the tract compared with a self-expandable metal stent, we do not perform overdilation of the tract. This indicates that even a plastic stent can contribute to achieving hemostasis of the bleeding from the tract as tamponade. As a limitation, this study was conducted with a small number of patients by experts of interventional EUS retrospectively. Our novel MD designed for EUS-guided interventions appears to be safe and useful. Further prospective, randomized, controlled studies involving a sufficient number of patients are warranted. We would like to thank Dr. Edward Barroga (http://orcid.org/0000-0002-8920-2607) Associate Professor and Senior Medical Editor from the Department of International Medical Communications of Tokyo Medical University for reviewing and editing the manuscript. Giovannini M, Dotti M, Bories E, et al. Hepaticogastrostomy by echo-endoscopy as a palliative treatment in a patient with metastatic biliary obstruction. Endoscopy 2003;35:1076-8. François E, Kahaleh M, Giovannini M, et al. EUS-guided pancreaticogastrostomy. Gastrointest Endosc 2002;56:128-33. Umeda J, Itoi T, Tsuchiya T, et al. Anewly designed plastic stent for EUS-guided hepaticogastrostomy: A prospective preliminary feasibility study (with videos). Gastrointest Endosc 2015;82:390-6. Khashab MA, Valeshabad AK, Modayil R, et al. EUS-guided biliary drainage by using a standardized approach for malignant biliary obstruction: Rendezvous versus direct transluminal techniques (with videos). Gastrointest Endosc 2013;78:734-41. Itoi T, Kasuya K, Sofuni A, et al. Endoscopic ultrasonography-guided pancreatic duct access: Techniques and literature review of pancreatography, transmural drainage and rendezvous techniques. Dig Endosc 2013;25:241-52. Itoi T, Sofuni A, Tsuchiya T, et al. Initial evaluation of a new plastic pancreatic duct stent for endoscopic ultrasonography-guided placement. Endoscopy 2015;47:462-5. Iwashita T, Doi S, Yasuda I. Endoscopic ultrasound-guided biliary drainage: A review. Clin J Gastroenterol 2014;7:94-102. Kitamura K, Yamamiya A, Ishii Y, et al. Electrocautery vs. non-electrocautery dilation catheters in endoscopic ultrasonography-guided pancreatic fluid collection drainage. World J Gastrointest Endosc 2016;8:458-65. Khashab MA, Messallam AA, Penas I, et al. International multicenter comparative trial of transluminal EUS-guided biliary drainage via hepatogastrostomy vs. Choledochoduodenostomy approaches. Endosc Int Open 2016;4:E175-81. Cho DH, Lee SS, Oh D, et al. Long-term outcomes of a newly developed hybrid metal stent for EUS-guided biliary drainage (with videos). Gastrointest Endosc 2017;85:1067-75. Oh D, Park DH, Cho MK, et al. Feasibility and safety of a fully covered self-expandable metal stent with antimigration properties for EUS-guided pancreatic duct drainage: Early and midterm outcomes (with video). Gastrointest Endosc 2016;83:366-73.e2.